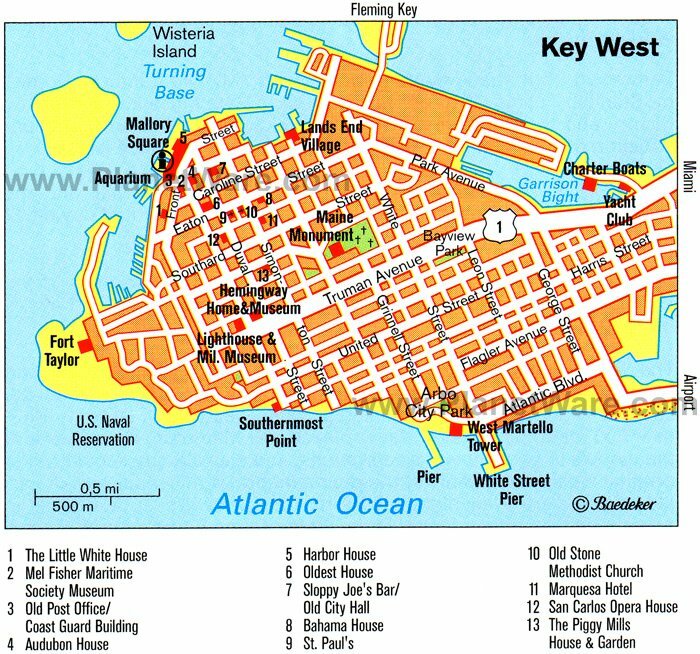 Most ships will dock at Mallory Square or the Truman Annex (Pier B.) Both are within easy walking distance of Old Town. Duval Street is only 2 blocks from the pier. Some ships, however, dock at the Outer Mole Pier (aka Navy Mole) on the outskirts of town. If your ship docks there, trolleys will shuttle you off the base and into Old Town. If your ship is anchored, tenders take you into the Old Town section of the harbor. Metered taxis are available in town, but unless you are traveling to the beach, most things are within walking distance in this compact town. Watching a splendid sunset while dining al fresco on delectable seafood at one of 250 or so restaurants is but one of the pleasures in store for visitors to the USA's most southernmost city, Key West, at the tip of the Florida Keys and at the end of US Highway 1. Packed with sights and attractions this historic island city supports a vibrant community, including a large gay population, and boasts a long seafaring and naval tradition, situated as it is at the gateway to the Caribbean, between the Atlantic Ocean and the Gulf of Mexico, and in close proximity to Cuba. Key West, also known as the 'Conch Republic', has a distinct Caribbean flavor, the streets of its old quarter lined with palms, tropical flowering plants and pastel-painted wooden colonial 'gingerbread' houses. It is a city that has been the favored haunt of greats like Ernest Hemingway, Tennessee Williams and Harry Truman, because of its relaxed atmosphere, colorful neighborhoods, legendary bars and restaurants, offshore fishing opportunities, and lively nightlife. The city also hosts innumerable pageants, parades and festivals, has a busy theatre culture and several heritage museums. The streets of Key West are alive with life, buskers providing impromptu entertainment for those lingering at sidewalk cafes or browsing the many stores. Visitors flock to 'The Bight', the old harbor, to arrange sea trips for fishing, snorkeling or diving. As the sun sets it is traditionally celebrated with drinks and good cheer on the Mallory Dock, before the nightlife awakens among the dozens of establishments in areas like Bahama Village, settled in the 19th century by Bahamian immigrants, and along Duval Street. There need never be a dull moment for any visitor to Key West. The only problem likely to be encountered is that you run out of time before indulging in all the attractions, excursions, tours, walks, experiences and events on offer. Some of the more fascinating activities include swimming with dolphins, a lantern-led ghost tour of the Old Town, a sunset sail on a tall ship, taking part in the 'southernmost city scavenger hunt', or riding the Conch Tour Train through 400 years of history. There are also innumerable attractions to visit, such as a butterfly conservatory, aquarium and a variety of interesting museums. Then, of course, there are lovely beaches to be enjoyed, all equipped with picnic tables and facilities, along with a host of water sports offered by local operators, not least of which are big game fishing and scuba diving. Audubon House & Tropical Gardens A visit to the Audubon House and Tropical Gardens is a step back in time to the world of a maritime pilot and master wrecker in mid-19th century Key West. Custom House Originally home to the island’s customs office, postal service, and district courts, this four-story architectural marvel was built to keep pace with the increasing population and wealth accumulating from Key West’s lucrative trade routes and maritime industries. The imposing structure is a tremendous exemplar of Richardsonian Romanesque architecture which was typical for Federal building projects near the end of the 19th century. Hemingway Home Ernest Hemingway lived and wrote here for more than ten years. Calling Key West home, he found solace and great physical challenge in the turquoise waters that surround this tiny island. Step back in time and visit the rooms and gardens that witnessed the most prolific period of this Nobel Prize winner’s writing career. Driving around Key West is difficult and parking is expensive. Many visitors choose to rent motor scooters, bicycles, golf carts or explore on foot. The closest beach is in Fort Zachary Taylor State Park, a 20 minute walk. Shopping and bar-hopping are probably the two most popular activities at this Cruise Port, but there are other options. The Conch Tour Train and the Old Town trolley, both provide an excellent narrated overview of the city. Dolphin Research Center : One of the most enjoyable activities on a visit to the Florida Keys is to get close to the friendly dolphins, which abound in the area. At the Dolphin Research Center visitors can enjoy half-day education programs, walking tours and a 'dolphin encounter', spending 20 minutes of structured swimming with the Atlantic bottlenose resident dolphins. Address: 58901 Overseas Highway, Grassy Key. Key West is regarded as a Mecca for shoppers after the unique, exceptional and even outrageous.